Load is applied by a hydrostatically lubricated ram. 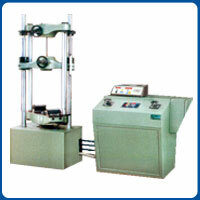 Main cylinder pressure is transmitted to the cylinder of the pendulum dynamometer system housed in the control panel. The cylinder of the dynamometer is also of self-lubricating design. The load transmitted to the cylinder of the dynamometer is transferred through a lever system to a pendulum. Displacement of the pendulum actuates the rack and pinion mechanism which operates the load indicator pointer and the autographic recorder. The deflection of the pendulum represent the absolute load applied on the test specimen. This unit permits selection of favorable hydraulic ratios producing relatively small frictional forces. Pressurised oil in the loading cylinder pushes up the measuring piston proportionately and actuates the special dynamometer system. The piston is constantly rotated to eliminate friction. The dynamometer system is also provided with an integral damper and ensures high reliability of operation. The load transmitted to the dynamometer is transferred through a pendulum to the load indicator.